With an election a matter of weeks away, our 2015 Homeowner Survey, sponsored by BLP Insurance, myhomemove and Trustmark, asked the UK public which of the major housing policies touted by political parties they support. The public wants fairness in the property market. The survey, carried out by YouGov, found that the overwhelmingly most popular policy would be a requirement for developers to market homes in the UK before marketing them overseas, a policy put forward for Londoners by Boris Johnson, with 80% of adults supporting it and only 3% opposed. It means that the most supported housing policy amongst UK adults is not being offered nationally by any of the main political parties in the upcoming election. It is the most popular housing policy in all regions of the UK apart from Scotland. The second most popular housing policy, proposed by Labour, is charging higher council tax rates on homes that are not occupied year round, with 70% supporting it, and only 13% opposed. There is support for increasing tax on homes worth over £2million, but the preferred option is introducing a new higher rate council tax band (supported by 68%, and proposed by the Liberal Democrats), rather than a new annual tax, or so-called “mansion tax” (supported by 60%, and proposed by Labour). Amongst those who value their own homes as worth 500k+ there is a massive 37% difference of opinion. 7 out of 10 support an additional top band of council tax on homes over £2 million, compared to one-third who support a new annual tax on property over £2 million. Government initiatives to help first-time buyers tend to be popular, such as extending the Help to Buy 5% deposit scheme (supported by 65%) and the Starter Home Initiative (offering discounted new homes to first time buyers and supported by 61%). This suggests that the recent Help to Buy ISA could also prove to be popular. There is a desire among homeowners to raise the threshold of inheritance tax, with 58% supporting it. 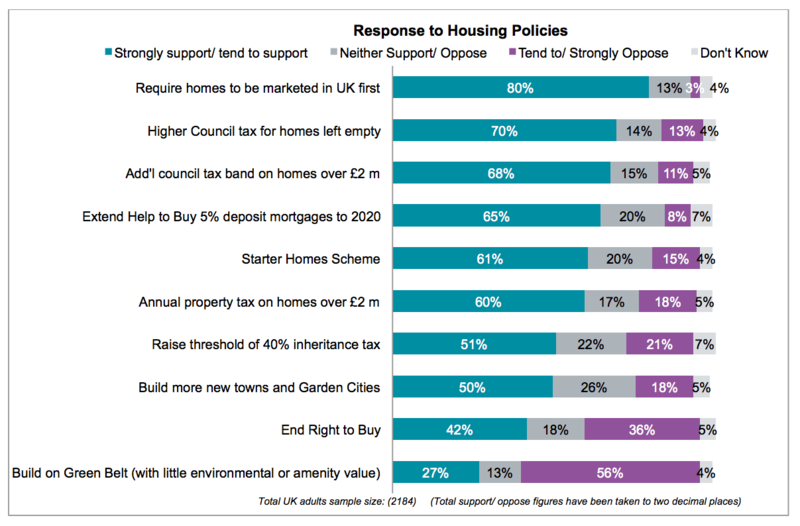 Support for the policy is higher amongst those who are older and those who have higher value homes, with 82% of those who value their homes as worth over £500,000 supporting it. However, only 40% of non-homeowners support the policy, with the average across the adult population being 51%. In terms of building more homes, there is little support for building on Green Belt Land, even if it is deemed to have minimal environmental or amenity value. The building of new towns and Garden cities is the preferred option. Support for increasing tax on homes worth over £2m, but, but introducing a higher rate council tax band is preferred over a new annual tax, or so called ‘mansion tax’. 68% are in favour of an additional Council tax on properties worth more than £2million and 60% support an annual property tax on homes over £2 million. However, amongst those who value their homes as worth more than £500k the difference is far greater – with 70% supporting an additional top band of council tax on homes over £2million, but only 33% supporting a new annual tax on property over £2 million. However, among homeowners, there is strong support for raising the threshold at which 40% inheritance tax is due. 58% of homeowners, and 82% of those who valued their home as near the inheritance tax threshold would like to see this rise. Regionally, there is greatest support among homeowners in the East of England (68%) and South East (67%). Programs aimed at helping first-time buyers tend to be popular. Nearly two in three UK adults (65%) support extending the Help to Buy 5% deposit scheme and most welcome the Starter Homes Initiative (61% in support). 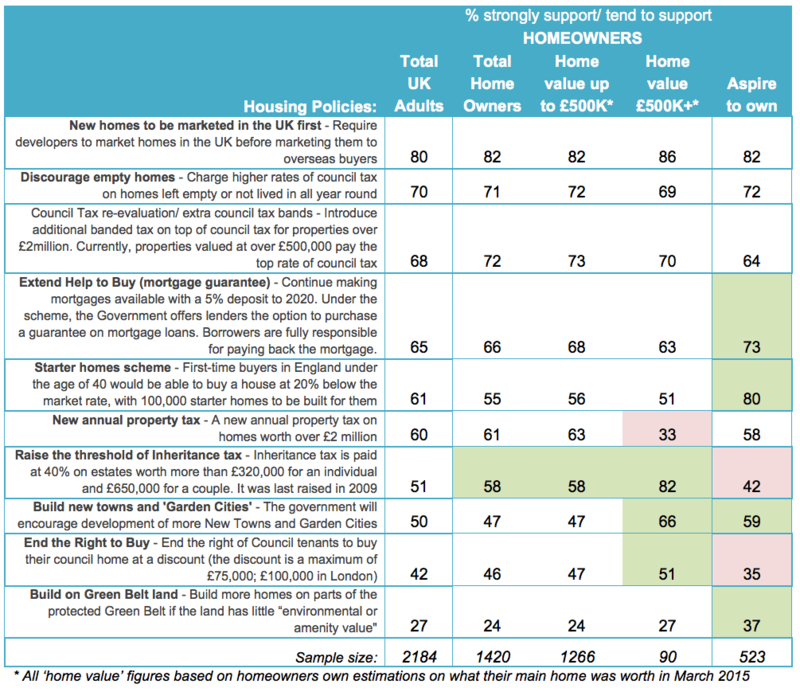 1 in 3 adults (36%) oppose an end to the Right to Buy your council home, although 42% support it. It is the housing policy that most evenly divides the electorate. 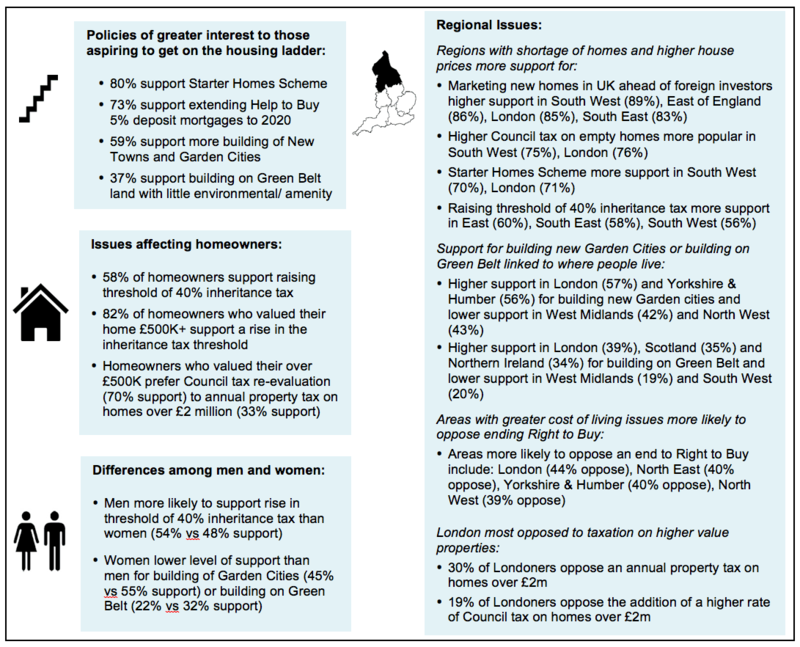 Regions most opposed include areas with a larger density of social housing – London (44% oppose) and the North (37% oppose) (see figure 2). In terms of the building of new homes, Garden Cities are preferred to building on Green Belt Land (even if it is said to have little environmental or amenity value). 50% support Garden Cities development, while 56% opposed building on Green Belt land even if it has little or no amenity value. In Scotland there is more support for increasing tax on high value homes and empty homes than there is for requiring developers to market properties in the UK first. “The unwavering popularity of initiatives to help first time buyers is no surprise and we applaud anything to help give aspiring homeowners a foot on the ladder. However the buck does not stop there and the whole industry needs to get on board to meet this increasing demand for homes. We need to make sure that we are building homes to last rather than simply chasing a house building statistic. Opposition to building on Green Belt Land highlights one of the biggest challenges faced by developers today – the shortage of available land. With solutions to the problem few and far between, we welcome any move to enable communities to take back under-used or unused land owned by Local Authorities. 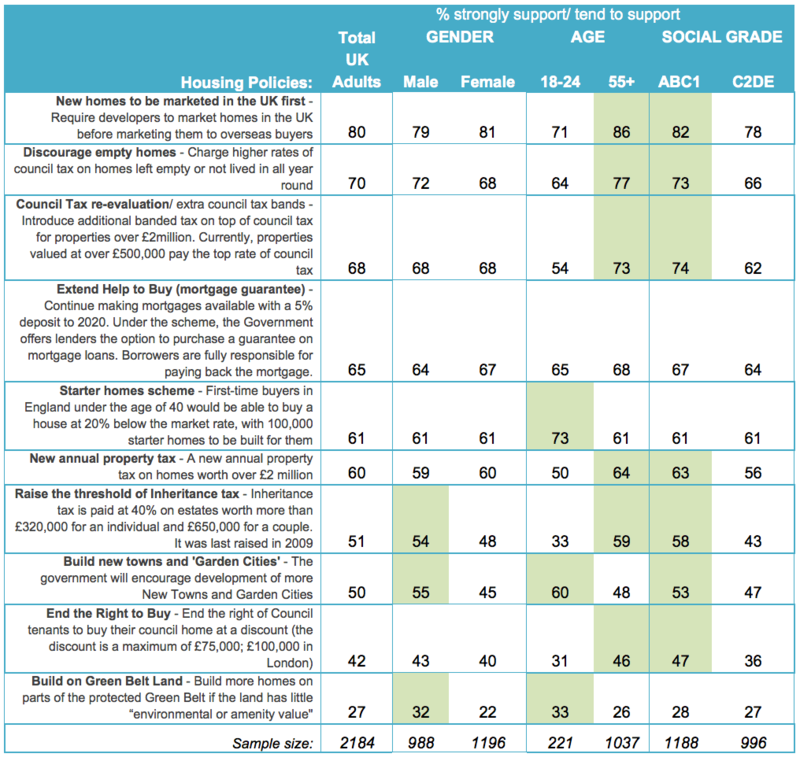 All figures in the 2015 Homeowner Survey, unless otherwise stated, are from YouGov Plc. Total sample size was 2,184 adults. Fieldwork was undertaken between 6th – 9th March 2015. The survey was carried out online. The figures have been weighted and are representative of all GB adults (aged 18+). The 2015 Homeowner survey was made possible through sponsorship by BLP Insurance, leading provider of housing warranty insurance, myhomemove, the UK’s leading conveyancing provider and TrustMark, the Government endorsed ‘find a tradesman’ scheme. We believe we are Britain’s most popular and fastest growing property advice website, staying true to our mission to help homeowners facing some of the biggest and most complex decisions of their lives. Last year, more than1.5 million homeowners and aspiring homeowners visited our website, www.hoa.org.uk, viewing over 2.5 million pages.